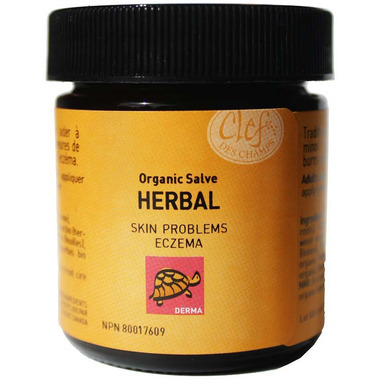 Clef Des Champs Organic Herbal Salve is traditionally used in Western herbalism to treat minor skin inflammations, wounds, burns and eczema. Non-medicinal ingredients: first cold pressed organic olive oil, organic beeswax. Adults and children: Apply generously on affected area. External use only. Consult a health care practitioner if symptoms persist. Do not use if allergic to plants from the Asteraceae or Plantaginaceae family. We have been using this product for almost 5 years now and it is amazing! It works great not just for eczema but also works well for any itches, bruises and minor scrapes. Itâ€™s the kids go to salve for mosquito bites. I was so excited to find that I can order it on Well.ca! This has been excellent for my face and neck. Recommended. I started using this for recently diagnosed eczema after the topical steroid I was prescribed ended up bleaching my skin after one application. I cannot believe it but my blotchy patches, soreness, burning and itching are leaving my skin alone! It has literally been 3 days so I hope it continues this way.